Get beaten with sticks, enjoy a concert, join the locals in the streets as they shower each other with vibrantly coloured powders and water, watch the 'Holika Dahan' or soak in the extraordinary experience of witnessing the band of wandering spiritualist minstrels of Bengal. Witness and experience Holi 2019 in a different than the usual way, as the whole country gears up for this festivity differently. 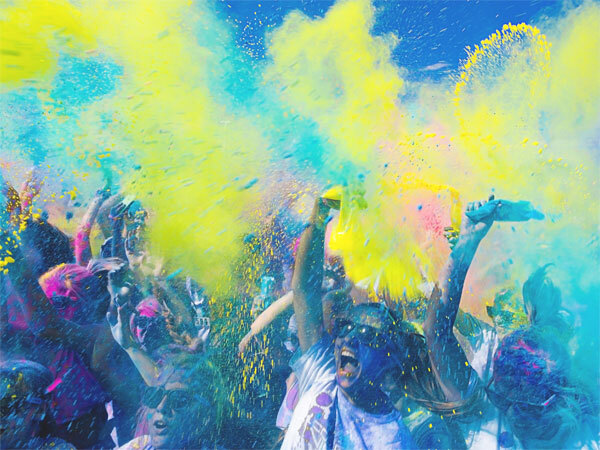 Holi, the world's biggest paint fight, is a celebration of love, hope and joy, officially ushering in the season spring. Traditionally held during the months of February and March, the precise date of this festival varies each year according to the Hindu calendar. The festival usually falls just before the vernal equinox at the time of the full moon however the Holi celebrations for the year 2019 is taking place on 20th and 21st March. With a long weekend coming up this Holi, put on your travelling shoes and travel to some of these destinations in India for some crazy Holi celebrations. This holi-day whichever place you pick to spend your Holi, make sure to get the most out of this iconic festival. Visit the twin towns of Mathura and Vrindavan to celebrate a traditional Holi. Mathura and Vrindavan, predominantly being temple towns, are places where Lord Krishna was born and raised. Holi is celebrated very fondly in his honour in these towns as well as in the regions around for more than a fortnight, as opposed to the 2 days in general. If you happen to travel to Mathura and Vrindavan around Holi, you can be a part of a special puja, and the numerous traditional customs and rituals that are carried out here in the honour of the Makhanchor or the butter thief, as the lord is fondly referred as. The Basanta Utsab or Vasant Utsav (spring festival) of Shantiniketan, near Bolpur in West Bengal, was introduced by the famous Indian poet Rabindranath Tagore. This festival is now an integral part of the Bengali culture and therefore, Basanta Utsab is a perfect time to visit the tranquil town of Shantiniketan, to immerse not just in the joyousness of the Holi festival but also in the Bengali tradition and culture. Clad in bright summer-coloured cloths, the students of the Vishwabharti University of Shantiniketan, that was founded by Rabindranath Tagore, put up spectacular cultural performances including singing and dancing, even to the works of Tagore. When it comes to celebrations, how can Mumbai fall behind? The livewire city of Mumbai in Maharashtra is known for its liveliness and fervour to celebrate all festivals. Mumbai Holi, too, is something that adds to the charm of the city. Partake in the colourful and musical Holi parties at multiple venues across the city, depending on personal choices and preferences. Most venues will have a DJ, food stalls, rain dance, flea markets, fun games and a lot of activities for kids as well as adults. If you are someone who believes in helping the weaker sections of the society, Dharavi is the place for you to spend time during festivals. This place, which also happens to be Mumbai's largest slum, lights up in the colours of festivity. Parties are thrown for the deprived communities here and 80% of what the tourists spend in such parties is also given away for the education and lifestyle improvement of these slum dwellers. Thus, spending your Holi here will give you peace of mind and make you feel good about yourself. Udaipur with all its royal demeanour and style, looks absolutely spectacular on th day of Holi. Head to this city for an memorable regal experience and join in the celebrations of the royal family of Mewar. On the eve of Holi, people light up bonfires or as the locals call it, 'Holika Dahan', to mark the occasion that wards off evil spirits as the good triumphs over the evil. Join in the magnificent palace procession with elaborately bejwelled horses that commences from the royal residence of the Mewar family to the lanes of Manek Chowk. Holi celebrations in Purulia, West Bengal, is a three day long extravaganza, which starts from 19th March and leads up to the final occassion of Holi on 21st March, 2019. Indulge in the celebrations as the local and tribal artists take over the festival with their incredible Chau dance, Darbari Jhumur, Natua dance, and remarkable songs. Run into some Baul musicians, the wandering spiritualist minstrels who perform and sing extraordinarily about the philosophy of life using the basic articulations. Catch a glimpse of the exceptional experience of Bengal in Purulia through the Basanta Utsav folk festival. The festival is organised by the villagers as a means to sustain themselves. Looking for something different to experience this Holi? Well, Jaipur is the place to be! Every year, on the eve of Holi, the Holi celebrations kick off with an elaborate elephant parade. The festival is not just of boisterous parades but also hosts elephant beauty contests, yes you heard that right! With gluttonous spread of local food, fireworks shimmering in the night sky, riot of lovely performances by the locals, Jaipur is probably one of the best places to celebrate Holi in India. Hampi is best suited for people who play Holi the less exuberant way. Holi, primarily being a North- Indian festival, the southern peninsula of the country celebrates this festival in a subdued fashion. However, Hampi being an exception to the list, the whole town rejoices with prolific drumming, dancing, tossing colours at eah other amidst the evocative ruins of the majestic Vijayanagar empire. The captial city goes all out when it come to the festival of colours. Bathed in various vibrant shades and hues, the city gets crazy with fun and frolic. If you want to try something unique this Holi, sign up for the most happening holi festival in the country, the Holi Moo Festival, formerly known as the Holi Cow Festival. Spen an awesome time in the mad 'moozik' festival with non-toxic colours, bhaang, street food and an incredible line-up of more than 40 Indian and International performers to add the rhythm to your Holi madness. If you are the type of person to celebrate the festival of colours in a more modern fashion, Bangalore is where you should be. There are a number of Holi-themed parties on offer. Entries to the same can be ensured either on a personal level or as a couple. The organisers of these parties ensure that there are enough colours and food (and in some cases alcohol as well) for all and that the merrymaking continues for hours together. Most of these parties are organised in Indiranagar and Koramangala. Unlike the usual display of colours, strength is what is on display in the annual fair at Anandpur Sahib in Punjab. Here men of the town indulge in various types of wrestling and martial arts. Thus, if you are someone who is fond of action, being in this place for the Holi celebrations will send an adrenaline rush through your body that will ensure that this is one of the most memorable experiences of your lifetime. Barsana in Uttar Pradesh is the most popular choice of destination for Holi because of the unique Lathmar Holi that takes place here. Played with traditional laths or sticks, the Lathmar Holi is associated with the legends of Radha and Krishna. It is said that when Lord Krishna used to travel from Nandgaon to visit his beloved Radha in Barsana, he playfully teased Radha and other gopis or the milkmaids. To chase him away, the gopis used laths. The Lathmar Holi takes place in Nandgaon and Barsana a week before the actual Holi. This year, the Lathmar Holi will happen on 15th and 16th March 2019. Be careful of the laths that might come hurling at you.